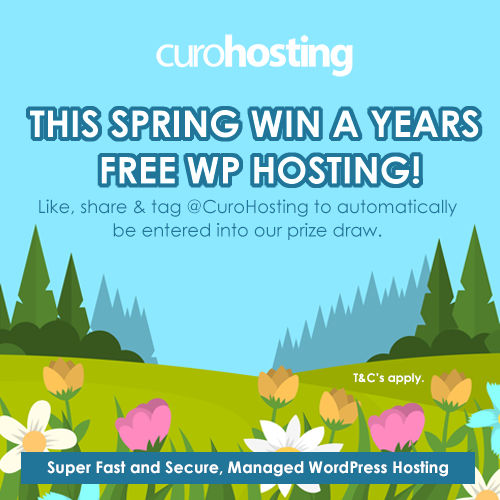 Win a Years Free WP Hosting With our Spring Prize Draw! Spring has finally arrived and to celebrate we are running our biggest competition to date. This month one lucky winner can win 1 years free, super-fast and secure Managed WordPress hosting! Yes, you read that correctly, one year of Managed WordPress Hosting for free! Our Bronze package comes with unlimited visits, a robust firewall and regular backups, not to mention our top-notch customer support. Winning our Bronze package will be the perfect way to spring clean your WordPress site. The winner will be selected at random. Keep your eyes peeled on our social media pages to see if you’re the winner. The closing date of the competition is the 29th April 2018. One winner will be chosen from a random draw of entries received in accordance with these terms and conditions. The draw will be performed by a random computer process. The draw will take place on 30th April 2018. The winner will be notified no later than the 4th of May via our social media pages. The winner must provide an email address to claim their prize. If a winner does not respond to CuroHosting within 14 days of being notified by CuroHosting, then the winner’s prize will be forfeited and CuroHosting will be entitled to select another winner in accordance with the process described above (and that winner will have to respond to notification of their win within 14 days or else they will also forfeit their prize). If a winner rejects their prize or the entry is invalid or in breach of these Terms and Conditions, the winner’s prize will be forfeited and CuroHosting shall be entitled to select another winner. The winner will be contacted directly via the social media profile they entered on. Winners must agree to being announced on social media. CuroHosting accepts no responsibility for any damage, loss, liabilities, injury or disappointment incurred or suffered by you because of entering the prize draw or accepting the prize. CuroHosting reserves the right at any time and from time to time to modify or discontinue, temporarily or permanently, this Prize Draw with or without prior notice due to reasons outside its control (including, without limitation, in the case of anticipated, suspected or actual fraud). The decision of CuroHosting in all matters under its control is final and binding and no correspondence will be entered into. *EDIT: The winner of this competition was Dave Parker.